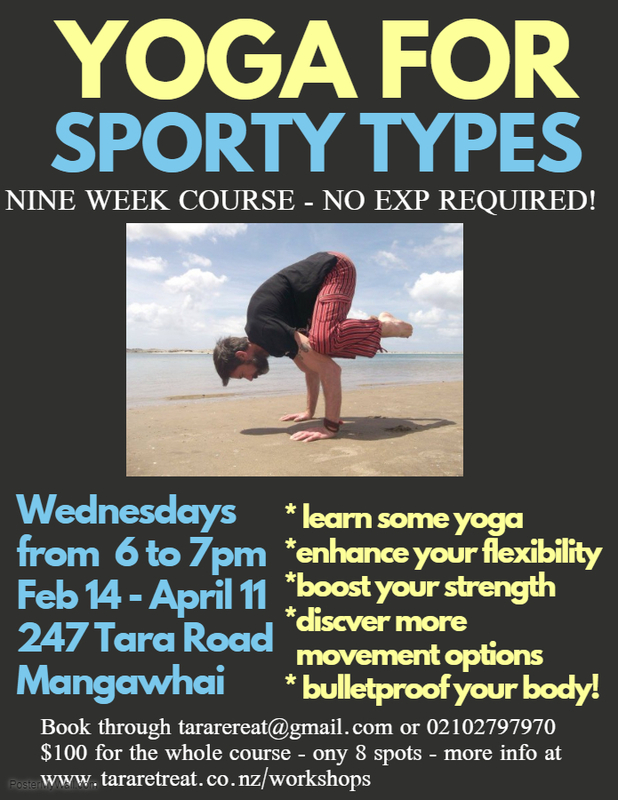 YOGA FOR SPORTY TYPES IS BACK FOR TERM 4! Do you live an active life and want to “bulletproof your body” so you can keep playing sport, surfing, running, biking, cross-fitting, or just keep up with your kids? Then my eight week course in “Dynamic Yoga” is for you. We will combine traditional, “power” and vinyasa yoga with bodyweight exercises, breathing techniques and animal flow movement patterns in a quest to become better movers. 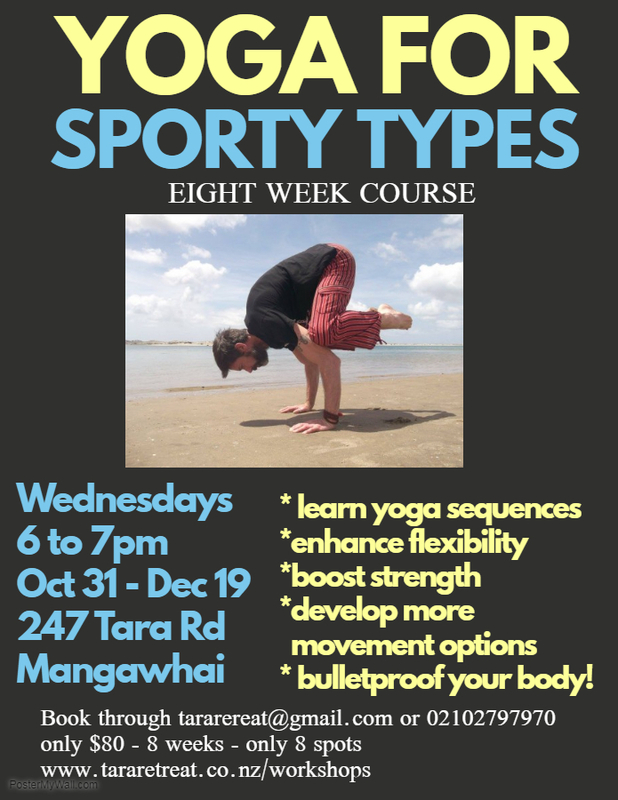 YOGA FOR SPORTY TYPES IS BACK FOR TERM 2! Do you live an active life and want to “bulletproof your body” so you can keep playing sport, surfing, running, biking, cross-fitting, or just keep up with your kids? Then my nine week course in “Dynamic Yoga” is for you. Join us at Tara Retreat for a screening of the new documentary Living the Change, which celebrates Kiwis pioneering change in their own lives and communities in order to live in a sustainable and regenerative way. Directors Jordan Osmond and Antoinette Wilson have brought together stories from their travels around New Zealand, along with interviews with experts able to explain how we come to be where we are today. From forest gardens to composting toilets, community supported agriculture to time-banking, Living the Change offers ways we can rethink our approach to how we live. Living The Change will be screened in the Tara Retreat Yoga Studio, 247 Tara Road at 8pm Wednesday April 4. BYO bean bag or pillow and some koha. RSVP is required due to limited numbers – email Glen at tararetreat@gmail.com to book your spot. The new film kicks off a series of fortnightly post-daylight savings docos at Tara retreat exploring consciousness, social issues, environmentalism, science and our changing world – with 100% of the “TR Doco Club” koha funds going towards projects in the poorest nations in the world via the kiva.org microloans platform. 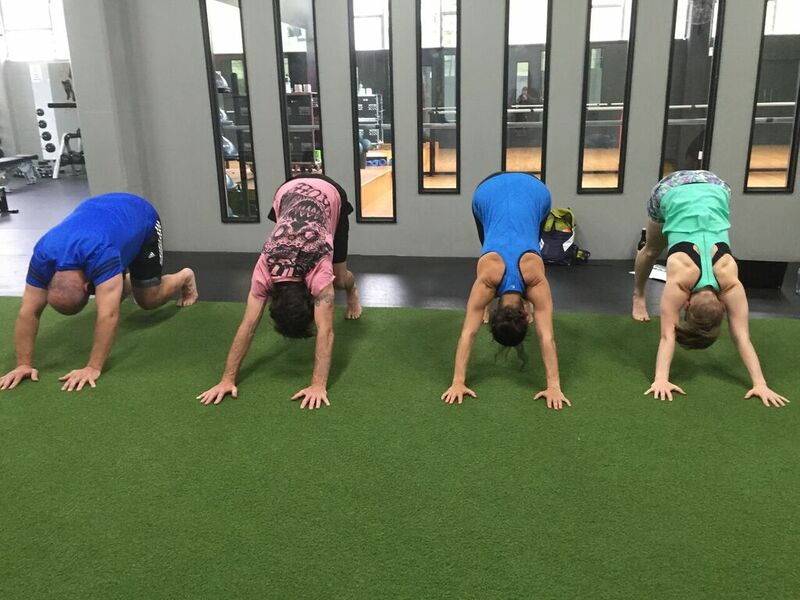 Expect to get stronger, become more flexible and increase your range and quality of movement. This is a fun, alternative and challenging way to learn more about your body so you can move the way you were meant to. Over the nine nights we will learn the fundamentals of yoga and asana (postures) to discover a host of new movement patterns. This is a fun, alternative and challenging way to learn more about your body so you can move the way you were meant to. Thursday nights from 6 to 7pm. 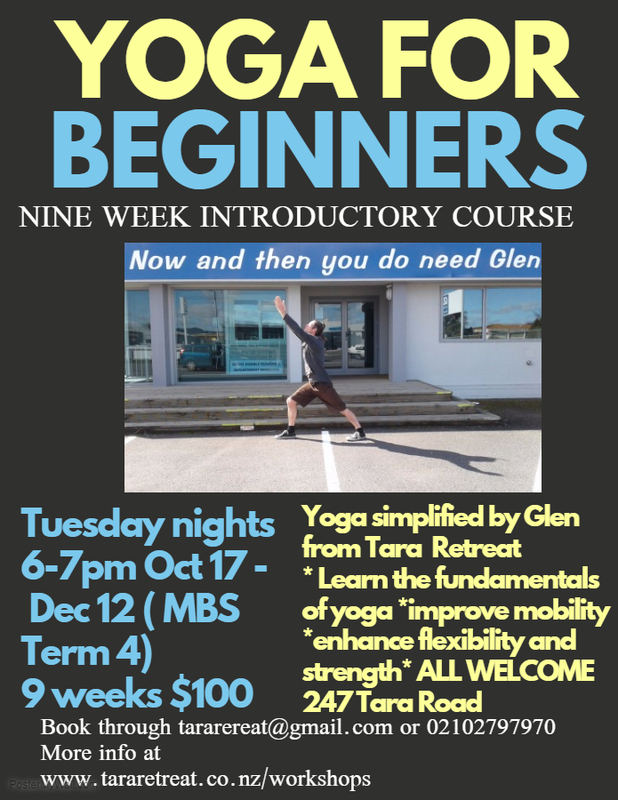 After the success of the Yoga for Beginners courses in Term 2 & 3, which were both full with the maximum of eight participants, I am excited to again offer another “introduction to yoga” course on Tuesday nights. Gets underway Tuesday October 17 and runs for nine weeks. Suitable for a wide range of levels – for the yoga newbie, or relapsed yogi, or a current practitioner who wants to “regress to progress” and revisit and refine the basics – or just someone who wants to get more movement back into their life – perfect ahead of the summer season. You will also gain the confidence and skills to build your own home practice or join in other yoga classes. 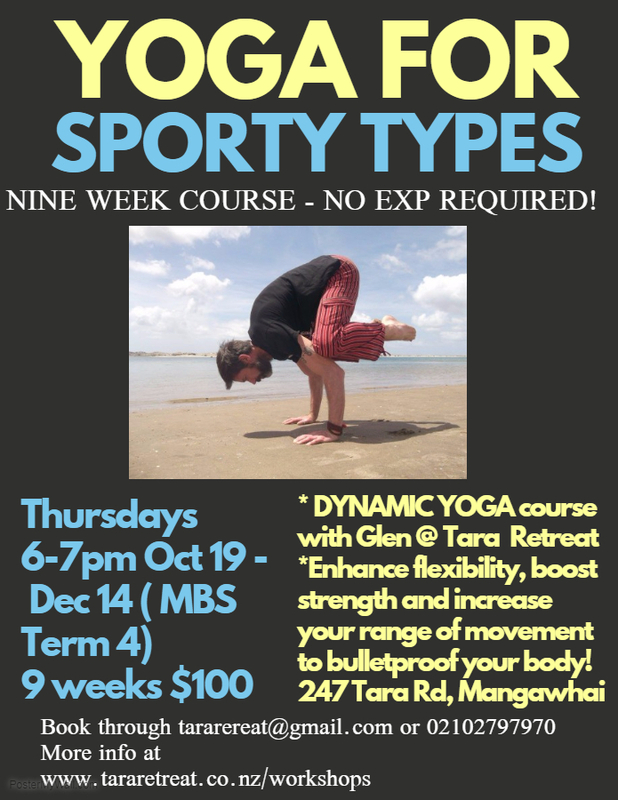 After the success of the Yoga for Beginners course in Term 2, which was full and fun with eight keen students of varying abilities, I am stoked to again offer an introduction to yoga course on Thursday nights. Starts on Thursday July 27 and runs for 10 weeks. Will be grand for a wide range of levels – for the yoga newbie, or relapsed yogi, or a current practitioner who wants to “regress to progress” and revisit and refine the basics or just someone who wants to get more movement back into their life. Thursday nights from 6 to 7pm from July 27 10 to September 28 (matches the school term). Held at Tara Retreat Yoga Studio, 247 Tara Road (look out for the black sign). Book now via tararetreat@gmail.com or ring Glen on 02102797970. Glen and Nicola are excited to be hosting a one-day, hands-on workshop where we can learn how to do kinesiology – accurate muscle testing and whole body testing – to identify areas of our body and mind under stress. You will also be empowered with FIVE easy-to-learn techniques that you can use at home to enhance muscle and organ function for yourself, your, friends and family members or your clients. No previous experience needed. “Your DNA is NOT your destiny.” Epigenetics is the study of changes in gene activity that do not involve alteration to the genetic code, but still get passed down through the generations. Genes can be activated and deactivated by signals from the environment – outside the cell and outside the body. This includes exposure to toxins, sunlight, foods and chemicals the brain produces when you think and feel. These techniques can help override any unwanted epigenetic activity. Meridian pathways to raise your body’s life energy. Increase emotional resilience and stress tolerance and gain clear thinking. The workshop will be run by Jeannine de Vere Hunt NZRK. 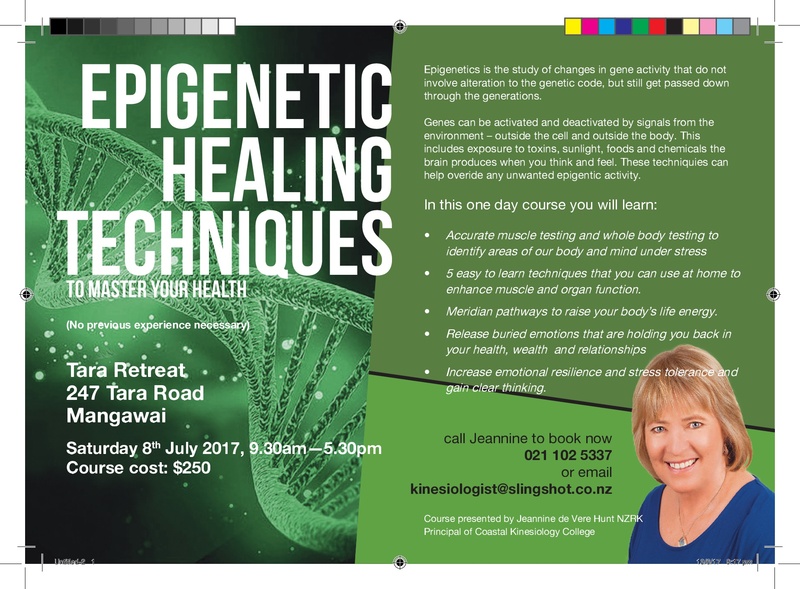 Jeannine has been involved with kinesiology since 1995 and runs clinics in Whangarei and Auckland. She is also a faculty member of the International College of Professional Kinesiology Practice. She specialises in nutrition and overcoming chronic conditions, both physical and behavioural. Jeannine is a certified GAPS Practitioner, dealing with the causes of autism and other learning challenges. Other qualifications include Bowen Practitioner, Neural Organisational Technique and Natural Medicine Practitioner. “Using muscle testing is like being able to look inside the body to find the cause of problems. Who wouldn’t want to do that and leave it to guesswork. I feel privileged to have a career that is such a contribution to our world”. We will supply tea and coffee and some snacks, BYO lunch. If you are coming from afar and want to stay at Tara Retreat for Friday and/or Saturday night, we have a self-contained studio, cob cottage and caravan available – half price for workshop attendees ($50 p/n for cob cottage or studio, $20 for caravan – see our accommodation page for more info). 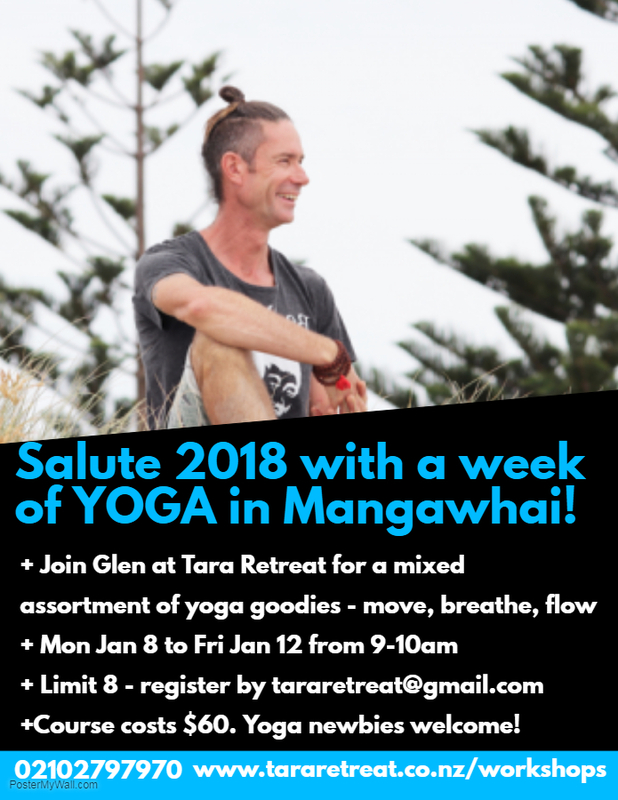 Glen will also be holding his regular yoga class at Tara Retreat from 8 to 9.15 am prior to the workshop and workshop attendees are welcome to join in for free. Workshop costs $250 and numbers will be limited to just 10 participants so we can get the most out of the day. 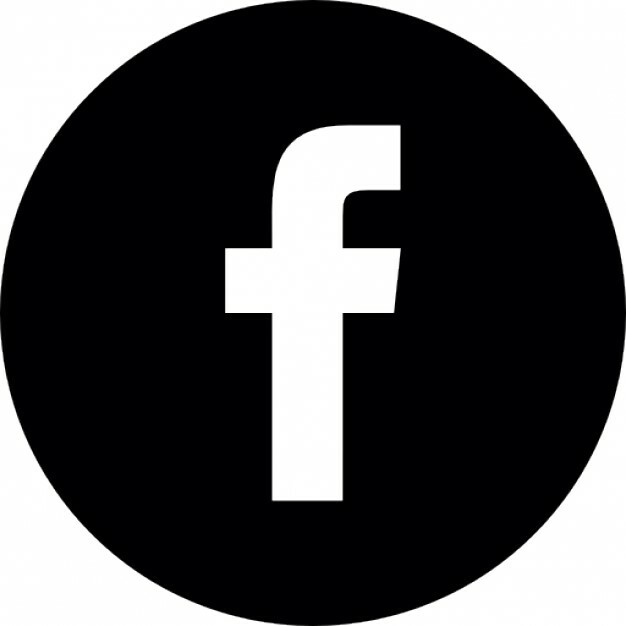 Feel free to ring Glen on 02102797970 or email tararetreat@gmail.com if you want to chat about the workshop and/or staying at Tara Retreat. I am excited to be holding a ten week introduction to yoga course on Thursday nights. Will be grand for a wide range of levels – for the yoga newbie, or relapsed yogi, or a current practitioner who wants to “regress to progress” and revisit and refine the basics or just someone who wants to get more movement back into their life. Thursday nights from 6 to 7pm from May 10 to July 6 (matches the school term). Looking for something new, fun and challenging to add to your workouts? Try Animal Flow! Animal Flow is fast becoming a global fitness phenomenon. It is an innovative ground-based bodyweight training programme designed by US personal trainer Mike Fitch that will enhance your mobility, strength, power, endurance, balance and agility and strengthen your mind-body connection. 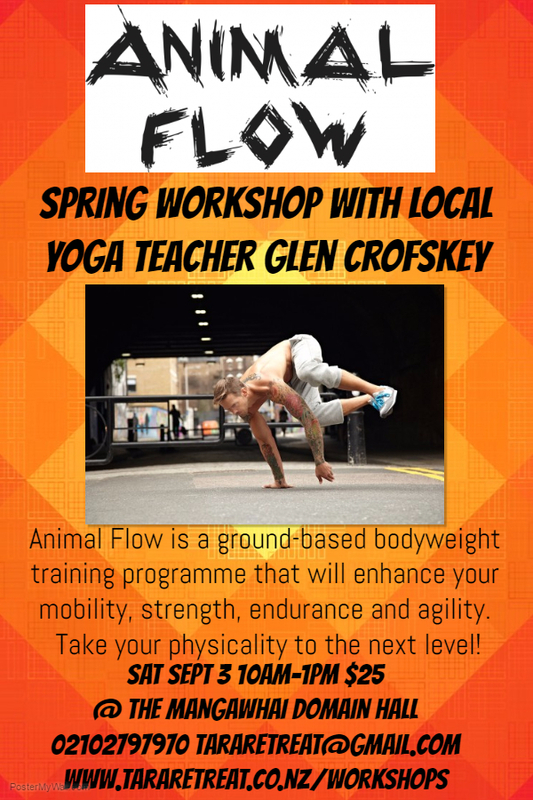 Whether you are a regular bootcamper, yogi, athlete or someone just wanting to get fit ahead of summer, Animal Flow is for everyone who wants to get into their peak physical condition and have fun while getting there. 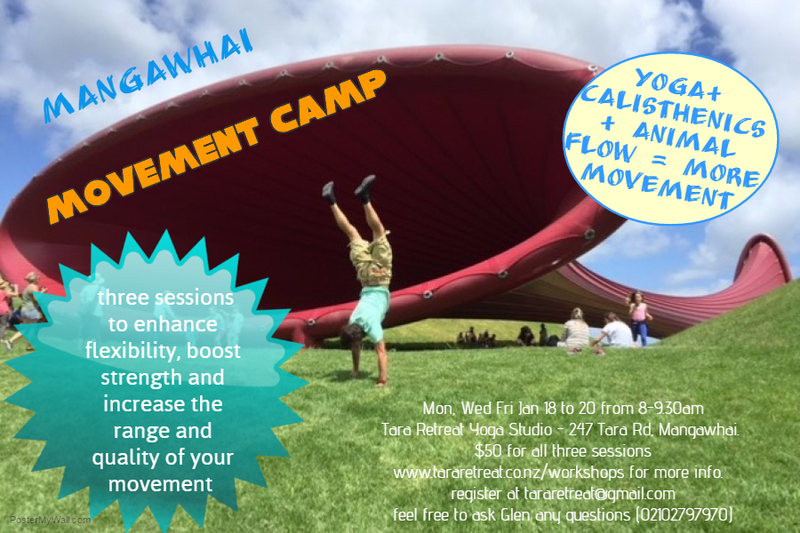 Join yoga teacher and certified Animal Flow instructor Glen Crofskey from Tara Retreat for a three hour introductory workshop designed to help you become a better mover. Book through tararetreat@gmail.com or ring Glen on 02102797970 for more info. 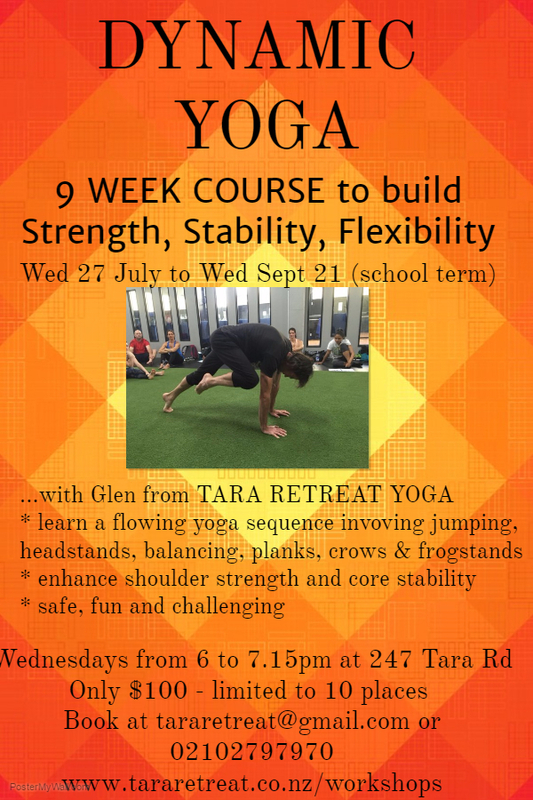 Join Glen for a nine week course in Dynamic Yoga – build strength, stability and flexibility and learn how to Flow With Form. Over the 9 nights we will investigate straight arm scapula strength and core stability, work on wrist mobilisation, enhance our flexibility and squatting abilities and become better movers. We will build up to being able to perform a dynamic yoga sequence involving jumping into crow stands, moving into and out of headstands and graceful strength elements. You will also gain the confidence and skills to build your own home practice. Wednesday nights from 6 to 7.15pm starting July 27 (matches the school term). $100 for the whole course – book now via tararetreat@gmail.com or ring Glen on 02102797970 – it will be challenging, but safe and fun! Join yoga teacher Glen Crofskey for three sessions that will provide an alternative, fun and natural way to boost strength, enhance flexibility and increase your range and quality of movement. We will combine traditional yoga with bodyweight exercises, breathing techniques and animal flow movement patterns – as well as work on our squats, planks, leaps and dynamic presses – and morph into apes, crows, crabs and crocodiles in a quest to bring more movement back into our bodies…. $50 for all three sessions. 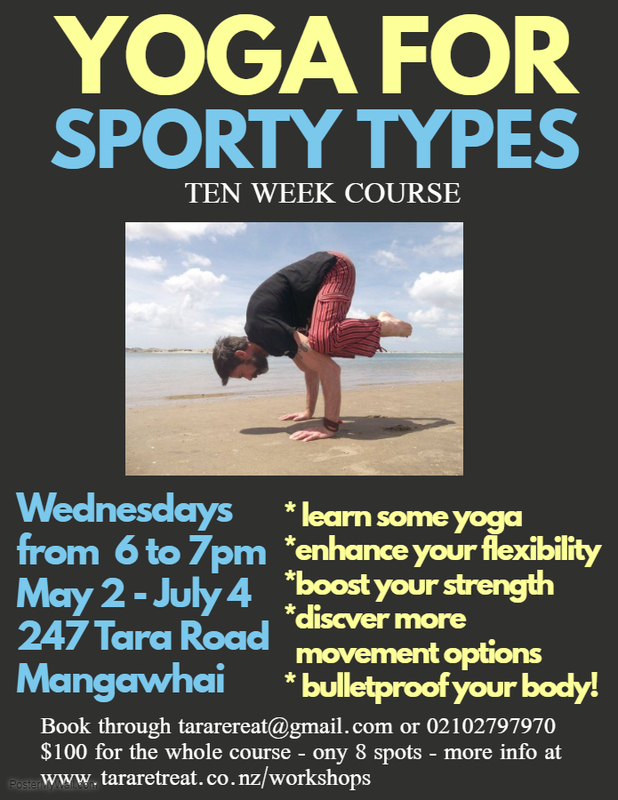 Make a positive start to your year with an energising week of daily yoga classes in Mangawhai. Glen Crofskey from Tara Retreat Yoga is running five morning sessions from Monday 11th to Friday 15th January 2016 that will be part workshop, part flowing asana, part strength work, which should leave you with a greater range of motion and ease. We will be learning and/or refining sun salutes and other flowing yoga sequences, working on improving strength and flexibility and make a positive start to the year. Beginners and more experienced yogis are most welcome. Restricted to eight participants, One hour classes start at 9am at Tara Retreat Yoga Studio, 247 Tara Road, Mangawhai. $60 for the whole five mornings, including a revitalising hot chai.